When treating a patient with Chiari related syringomyelia by posterior fossa decompression, it is important for the neurosurgeon to open the dura and the arachnoid and evaluate the outlet of the fourth ventricle which drains CSF into the cisterna magna. The outlet called the foramen of Magendie after its discoverer is also known as the median aperture. Approximately 1 of 10 persons with Chiari/syringomyelia has a veil over the median aperture blocking or restricting CSF flow. 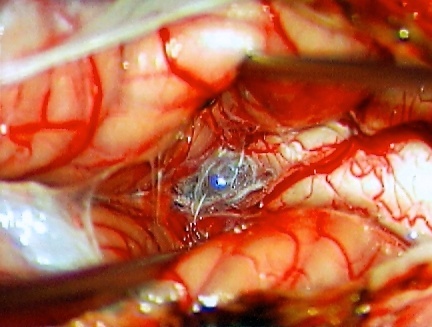 Clearing the obstruction by microsurgically opening the veil facilitates syrinx decompression and helps avoid revision surgery. case of a 32-year-old woman who underwent surgery for CM associated with extensive cervicothoracic syringomyelia and whose intraoperative somatosensory evoked potentials (SSEPs) did not notably improve after craniotomy or following durotomy; rather, they only improved after opening of the fourth ventricle and restoration of CSF flow through the foramen of Magendie. Postoperatively, the patient recovered completely from her preoperative neurological deficits. To the authors' knowledge, this is the first report of significant SSEP recovery after opening the fourth ventricle in the decompression of a CM-I. When evaluating patients referred for persistent syringomyelia following posterior fossa decompression, who on MRI studies appear to have an adequate decompression, a careful review of the operative note should be performed to determine if the dura and arachnoid where opened during the initial procedure. If the dura or arachnoid had not been opened, the revision surgeon should consider exploration of the posterior fossa and examination for a possible median aperture veil (retained rhombic roof) as the preferred treatment strategy instead of placement of a syrinx stent or shunt.